Well, after a few years of watching an enjoying everyone else's posts and pictures, it's time for me to bite the bullet and give a litte. What's a better opportunity than my recent birthday dinner? My standard disclaimer: I live in Stockholm, Sweden. I'm American (from mid-Illinois) but have lived here for about the past ten years. Why post this on LTHForum? Because I like it here! 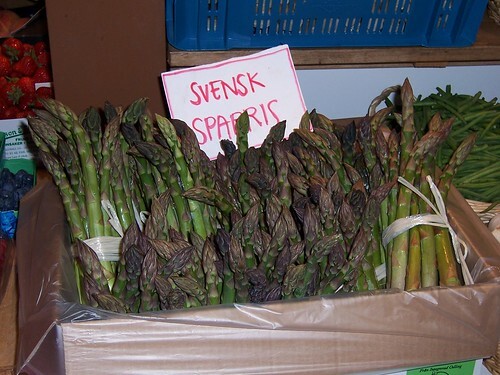 It all started about 12 hours ago with a trip into central Stockholm to pick up some ingredients at Stockholm's finest market: Östermalmshallen. 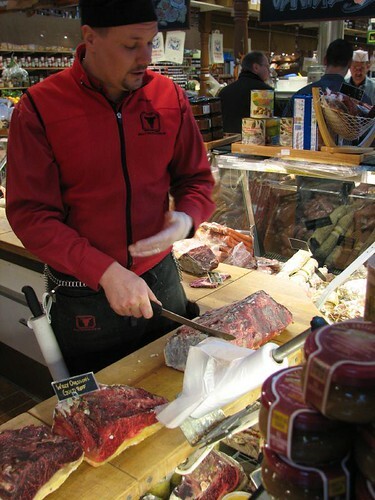 Here, I went immediately to what I believe is this country's only purveyor of dry-aged beef: Willy Ohlsson's. 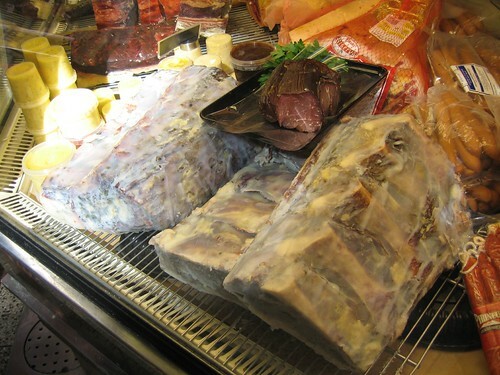 They've got at least two levels of dry-aged. I usually stick to their normal level which, at around 4 weeks, I find perfect. They have what they call a "gold" level which is actually dipped in tallow to seal it and allow for longer aging but I've had it a few times and had to come to grips with the fact that I find it too intense. 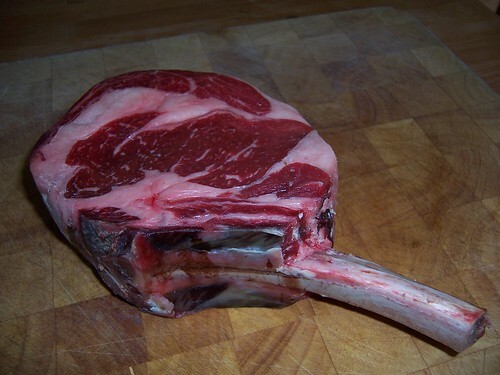 I saw the Cote de Boeuf and knew that I'd found my dinner. They nearly always have boneless ribeye, tenderloin and boneless strip steaks, too. After a few seconds of trimming off the dried out edges, I moved on. A few more supplies later, it was time to rush home and plan dinner. 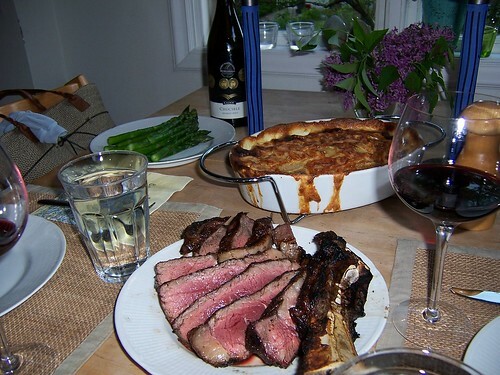 Well, plan and plan... Grilled ribeye, gratin dauphinoise and lightly boiled and buttered asparagus seemed a natural choice. The dry-aged, bone-in ribeye was introduced to a little hardwood charcoal on the one of Sweden's few New Braunfel's grill/smokers. And, finally, dinner was served! Last edited by Bridgestone on June 11th, 2006, 10:13 am, edited 1 time in total. Hmmm... Obviously, I'm still a rookie at this. I'm a little disappointed that my URL's turned out to be links instead of actual photos. I've looked at at least one photo-releated thread in Site Chat but can't see what I've done wrong. Wrap the image urls in [img] tags, e.g. to clarify just a little- highlight the url, then click the img box (above the text box), and it will put the img tags there for you. I love this post! Your dinner looked sensational. Hopefully you'll keep sending us more Stockholm photos and info. YUM!!!!! 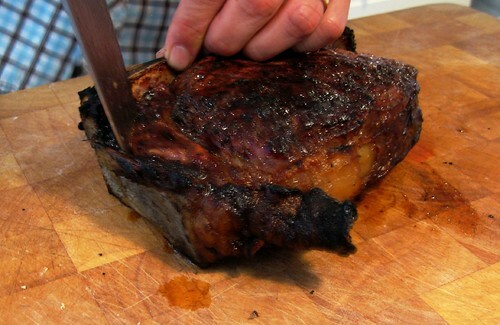 I don't care if the pics weren't imbedded.....that was one amazing looking piece of beef! I nearly D I E D when I saw that bottle of Jever pils.... Oh my good lord. My brother was a tanker stationed just north of Bremen for 3 yrs in the late 80s. His local poured Jever: the crispest, cleanest, cutting-crystal pils I've ever tasted! Next time you pop one, pls face West by slightly South and think of us, bereft of Jever. Nice post, btw. I mean, once I got over seeing the bottle of Jever, I was able to appreciate that hunque of meat you worked so lovingly with. Keep us posted from Sweden! You can get Jever here in Chicago at a couple of bars. A friend of mine is quite the Jever fanatic. Great pics, Bridgestone, other than the fact that they're of Sweden. Thanks for the technical help. I now see what I did wrong. And, even more thanks to whoever just went ahead and fixed my links for me! Yep, Jever is a wonderful summer pilsner. Hoppy to the point of bitterness but cleaner and crisper than the super-hopped IPAs I was drinking last time I was home in the States. Sill. Nowhere near the selection that they will soon be building up to in the weeks before midsommar but as far as quality goes, it's about as good as it gets. Closest looks like tomato sill, next is curry sill followed by matjes (hard-to-explain but traditional seasoning), a couple of creamy and garlicky types and finally onion sill. 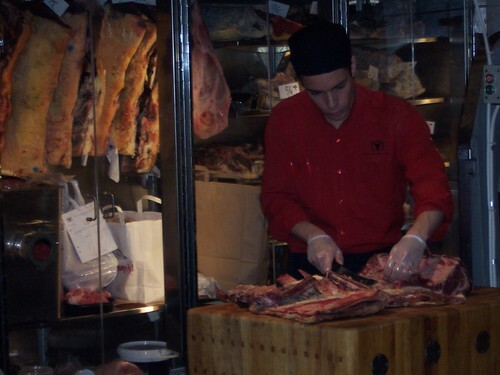 Another meat specialist at the market. 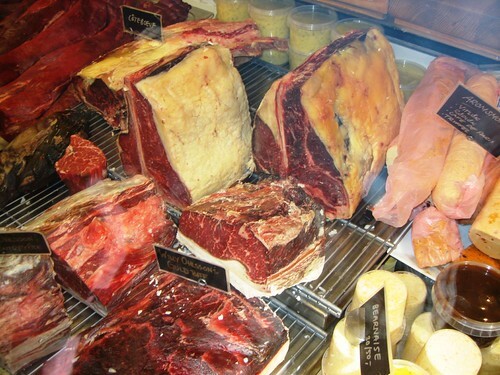 They don't do dry-aged beef but they usually have an incredible selection of game. 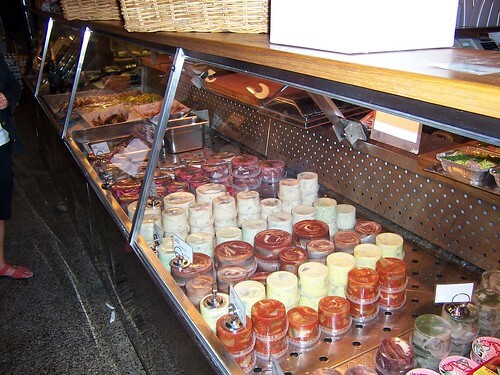 Being spring, though, the selections are a little slim (and some are even frozen). The veal was French and looked incredible. 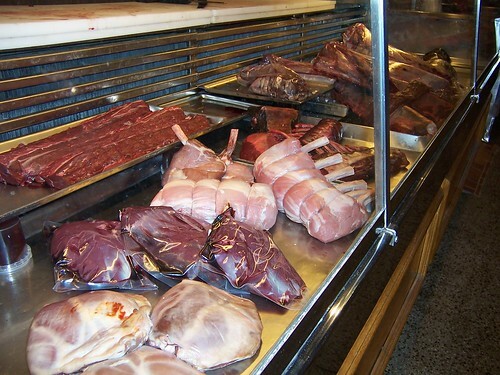 The darker meats are either elk or reindeer, Swedish and perfectly aged. I'll need to get back here with my camera when hunting season begins the autumn as this picture simply doesn't do justice to their selection of fowl. It's hard to see under all that plastic but I'm guessing wild ducks. That's a ptarmigans in the very bottom right of the shot and the saddles in the back that say "kalv" on them are young reindeer. Finally, dinner last night deserved a proper finish so I left the market and went to Broberg's down the street and their humidor. I nearly went with my normal choice of a Davidoff 2000 (Dominican Republic) but let myself get talked into a Cohiba Robusto (Cuban). 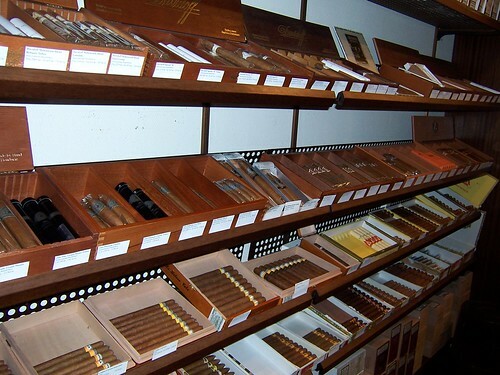 I think those Cohibas standing vertically in their box (as opposed to the rest laying horizontally) are the Robustos. Truly an exquisite cigar. 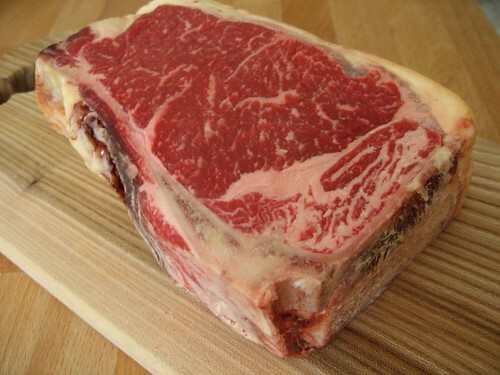 A visit from my Chicago-based brother was more than enough reason for picking up some dry-aged beef. 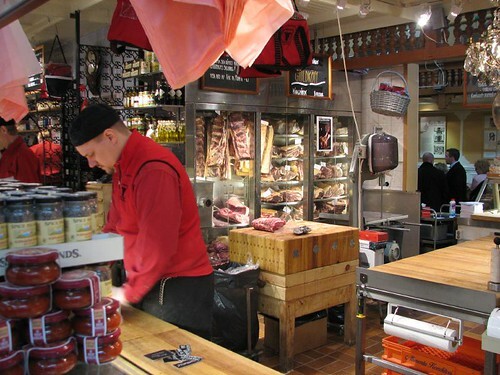 The gentleman helping us at Willy Ohlsson’s (at Östermalms Saluhall) quickly noticed our interest and took the opportunity to educate us regarding this butcher’s incredible products. You can see the beef aging in the background. I’ve always known that Willy’s has two types of dry-aged beef and have convinced myself that I prefer the “normal” aging. I think it was when the clerk overheard me mention this to my brother that he decided to set me straight. 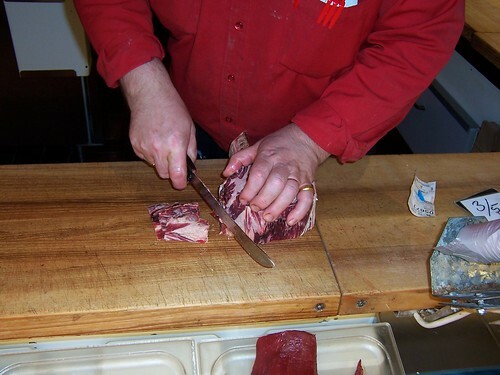 It turns out that Willy’s dry-ages all of their beef for an initial 30 days. 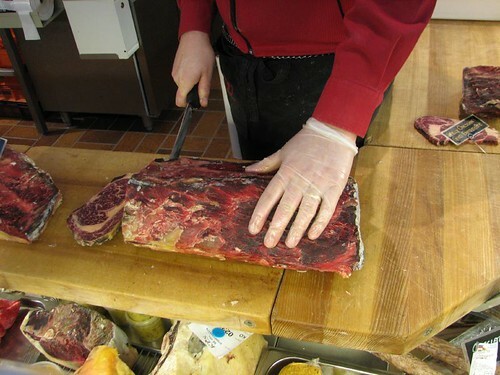 When this is done, they cut off the end of the primals and various cuts (short loins, tenderloins and ribeyes) to inspect. 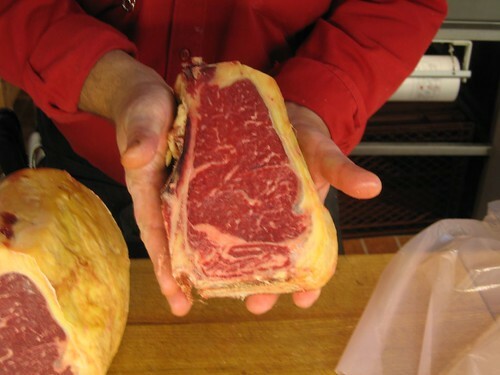 If they deem the meat to be exceptionally high-quality, they then dip the meat in tallow and let it age for another 30 days. 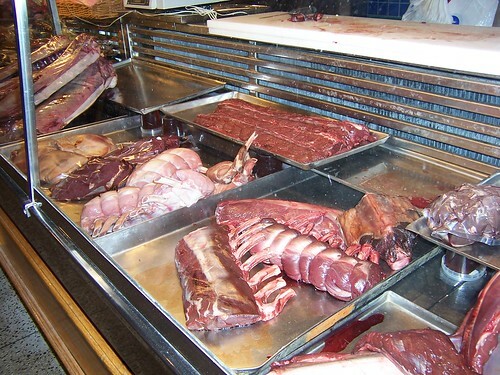 The meat that does not make the cut is sold as 30-day aged, “normal” beef and the 60-day aged beef is eventually sold as their “Gold” beef. 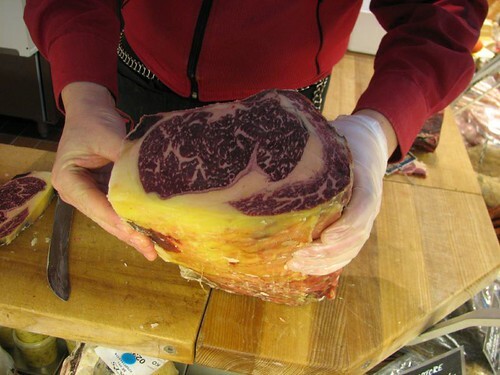 In the course of describing this process, our clerk brought out an uncut 60-day aged rib roast, sliced off one tallow-coated end and proudly showed us what he believed to be some of Europe’s only 60-day, dry-aged beef. 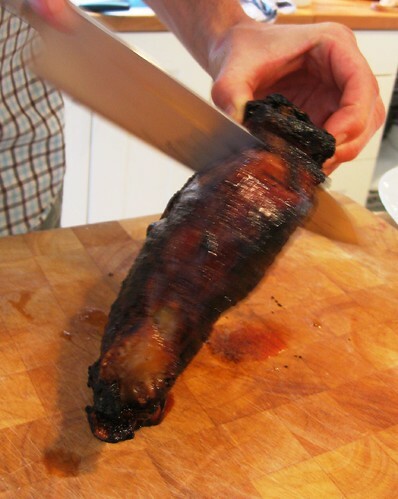 He then proceeded to slice off a thin slice of this roast and offer my brother and myself a taste of the raw beef. The texture and flavor of the raw beef is remarkable. 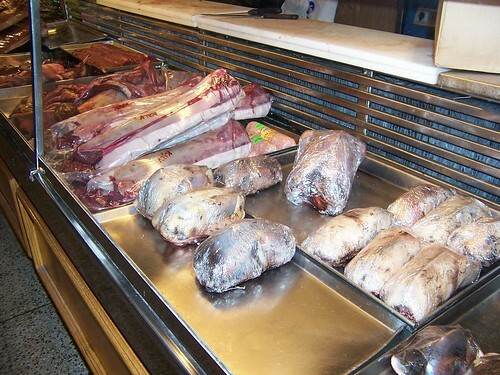 The fat picks up a nuttiness that is very similar to high-quality cured and aged ham. 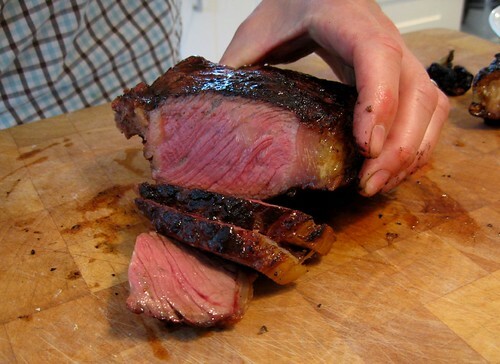 The flesh is meltingly tender and has the deep, metallic flavor one associated with dry-aged beef. 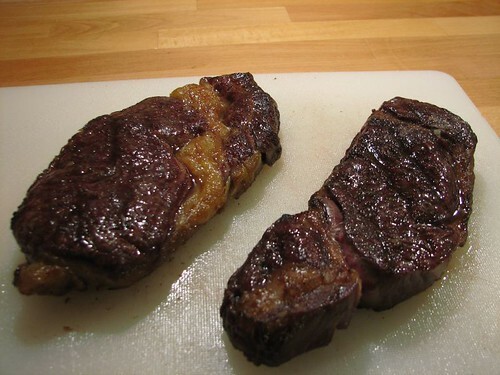 As much as I enjoyed the 60-day beef raw, I held my ground and we ended up purchasing one 60-day dry-aged ribeye steak (on the right) and one 30-day (on the left). 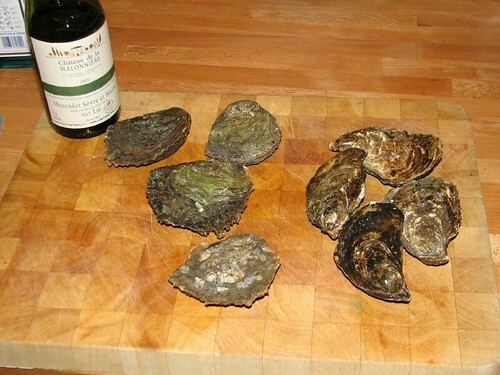 (We also picked up a few oysters to have before the steaks: Swedish belon and French Pousse en Claire. The Swedish belon is, perhaps obviously, an offspring of the French belon that has been bred in the cold, deep waters off the west coast of Sweden. The cold waters and slow growth of these oysters seems to amplify their already-strong metallic notes and the flavor/sensation virtually clamps down on the back of your throat a few seconds after consuming. 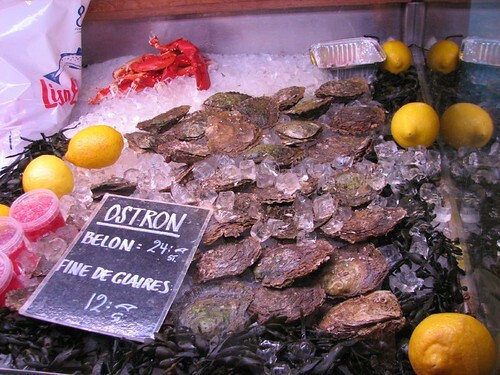 The Pousse en Claire is an exclusive oyster that has spent up to 8 months in a claire with as few as 3-5 other oysters per square meter). What else is there to say? 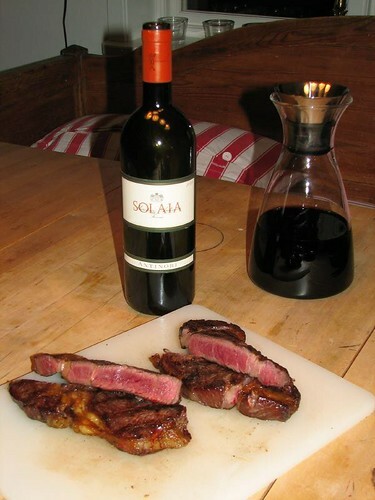 Grilled over hardwood charcoal, served with a salad, truffle oil-tossed roasted potatoes and a magnificent, exceptional Super Tuscan (Thanks big brother!). 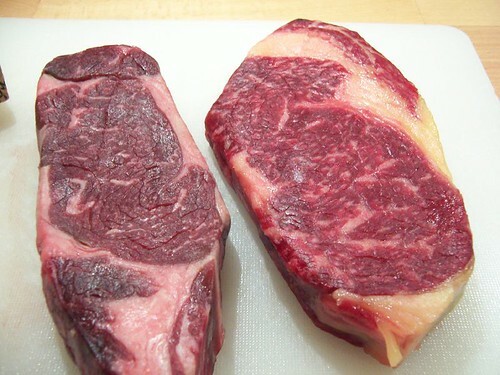 The taste of the beef, when cooked, is outstanding and there were clear differences between the two. 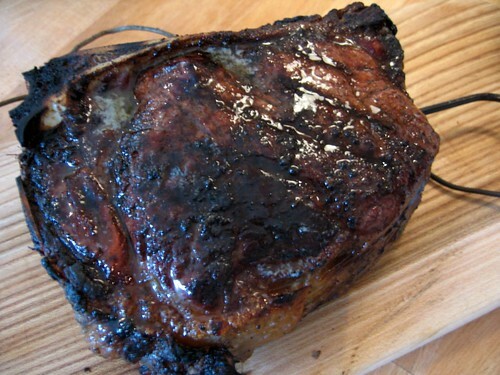 I still really enjoy the 30-day and the taste of the charred fat is what I associate with a steak. However, the nuttiness of the 60-day is addictive. 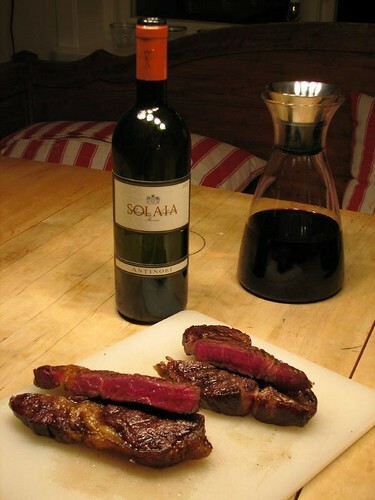 I will say that the 60-day beef is exceedingly rich and required small bites and a relaxed pace (alone with many, many wonderful sips of the Solaia) to consume. For reference, these two steaks ran us about (I picked up a few other items and forgot to ask for a receipt) 40-45 dollars. For me, this is a steal for this type of craft but I don’t think that there is enough appreciation for these products in Sweden to support higher prices. Bridgestone, you have done it again. Your photo posts floor me every time. Thanks for taking the time to share. But, truth to tell, I *think* I might be most jealous of the belons... where oh where in Canadia are they to be found??!! Just a fabuluous feature, tnx sooo much Bridgestone for sharing it with us! Outstanding post(s). 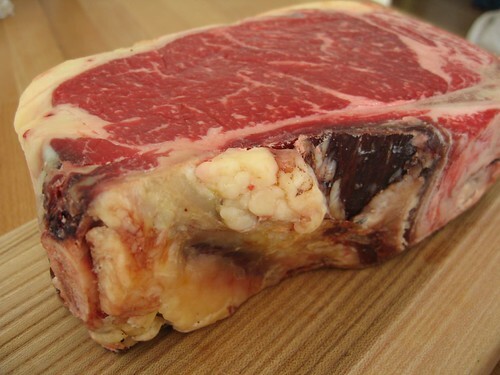 I can nearly taste that dry aged beef. The one cognac-filled piece I set aside for myself was quite divine. My photo isn't nearly as mouth-watering, but at least I can prove I was there. I'm very, very glad to see that you at least were able to visit the market, Ann! Thanks everyone else for the kind words! Fabulous post! - My mouth waters for reindeer and wild game - ptarmigan sounds fantastic; I assume the reindeer are domesticated and ranched. The seafood stall was nice. Re: Swedish reindeer. I'd say that they are somewhere in between wild and domesticated. The indigenous people of Sweden, the Sami (aka "Lapps" in the non-pc term), have been living off of reindeer since, well, since human beings have lived in these cool climates. And, while the Sami tend to follow the natural wanderings of the reindeer, a certain amount of domestication probably has not been avoidable over the past millenia. This process was also effected by the near-total destruction/slaughter of Sweden's native reindeer population immediately following the Chernobyl accident (radiation came up to Northern Europe and was quickly absorbed into the lichen the reindeer eat). Stocks were replenished with Norweigen and other reindeer but, well, the gene pool has been altered/replaced. That said, these reindeer roam freely in the Northern parts of Sweden and are still following their ancient migrations from highlands in the summer and lowlands in the winter. They may get the occasional help from the Sami when natural food stocks are low or in the case of illness but largely, they are pretty much wild. Bridgestone, we saw on a television program recently that the reindeer are having a hard winter because of "warm" weather. 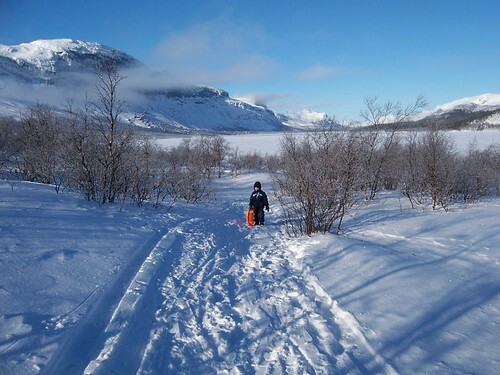 The native reindeer herders said that, normally, the temperatures are zero or below and that creates soft dry snow (what I call "Splenda" snow). This is an easy surface for the reindeer to paw through to get lichen. In the winter, the herders are able to let the reindeer fend and forage for themselves. But this winter, the weather has been warmer with some days at or even above freezing. The wet snow, rain even, and thawing and freezing have caused the formation of a rather thick crust of ice that the reindeer are unable to scratch their way through. As a result, reindeer are starving and the herders, insead of getting a break over a few months, have been having to go out on snowmobiles and round up the deer to drive them into pens where they are fed expensive grains in lieu of lichen. I don't know when this program was filmed. I wonder if you know if this is still happening or was this last winter? Your posts are amazing. The photography is outstanding and the text is interesting. It is obvious the amount of work and care you take to lay everything out to tell each story. We are very graeful for your efforts! Wow, Joy! I'm practically blushing! Thank you for kind words! Re: reindeer and the warmer winters. I can only imagine that things are a little crazy up there this year, too. I was actually in far-north Sweden about one month ago and there was close to 6 feet of snow (our guides said it was the most snow that they've had in 14 years)*. And, it had been a pretty cold winter, too. But, the winter was shorter than usual. It started late after an unusually warm and long autumn and ended early with non-freezing temperatures and melting snow already in the beginning of March. This would definately effect the reindeer, their wanderings and their access to natural food supplies. There are other noticable effects of warmer temperatures up there, too. Over the past 15 years, the tree line (in Alpine regions, determined by the border to where there is too much annual snow for trees - mountain birch, here - to root and grow) has slowly crept higher and higher up the mountains. The flora and fauna is also changing/adapting. I read yesterday that native freshwater catfish (endangered here) are making a comeback because they are better adapted to the warmer summers that Sweden has been experiencing for the past 10-15 years. So, to get back to your question - I haven't read or seen anything about the Sami herders needing to feed the reindeer this year but it wouldn't surprise me if they have needed to. * This, however, is the exception for Sweden this year. I'd guess that something like 95% of Sweden had unusually little snow and warm temperatures this past winter. Ironic that I'd attempt my first LTHForum photo posts as an add on to my brother's first LTHForum photo posts, huh? Bridgestone mentioned that I had some additional pictures of some items at the Saluhall, so I thought I'd try to post them. 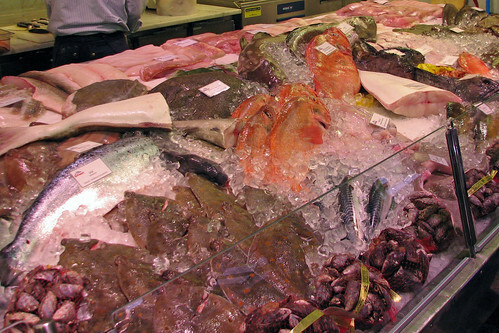 I'm going to focus on the seafood stall, which was right behind the butcher's counter that we purchased the steaks from. The seafood spread was especially amazing to one coming from a landlocked part of the US. Every fish was pretty clearly still swimming that morning as you can see in the closeups. 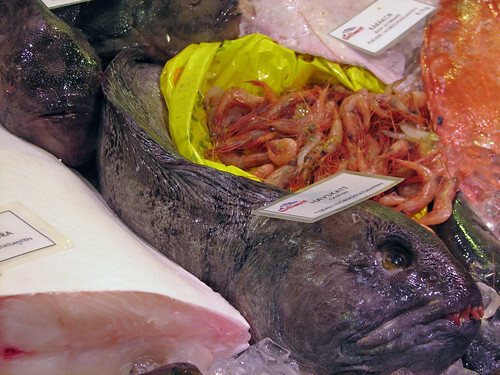 Cod were so fresh that they seem to stare back from the bed of ice. A full plate of cod's tongue was particularly tempting, but already had the 60 day dry aged beef and had selected our oysters by the time we saw these. I'd love to try them, but the beef experience was too good to second guess. 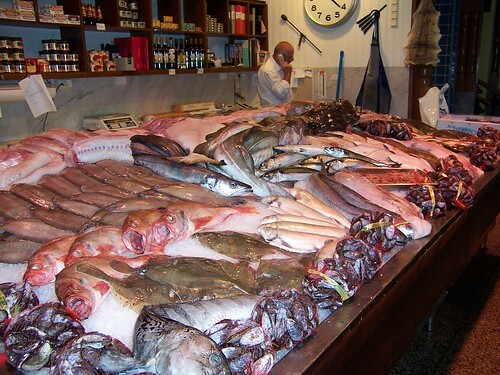 I am obsessed with seafood, and can usually recognize most things offered in the fish market, but this one is a new one for me... Any idea what it is and where it is usually fished? The Swedes call it a "havskatt" which translates to "sea cat". Somewhat confusingly for us midwesterners, "sea cat" frequently gets changed to "catfish" on many English menus over here... I believe that the proper English term is "wolf fish" or "sea wolf". Wikipedia has a decent entry on sea wolf that I've unsuccessfully tried to link to. It's a tasty fish with very firm flesh. Those ridiculous-looking teeth are used for crushing the shells of the mussels and crabs that it feeds on deep in the North Atlantic. 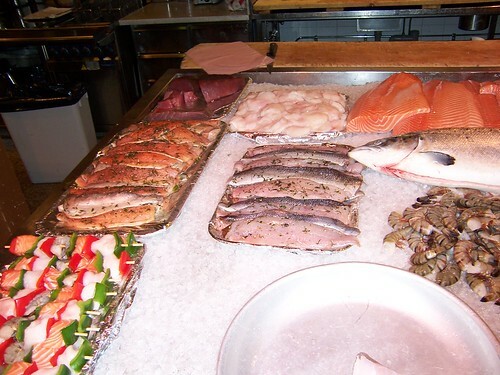 We call this fish Steinbitur in icelandic, which means Stonebiter. This is due to its impressive teeth and strong jaws. 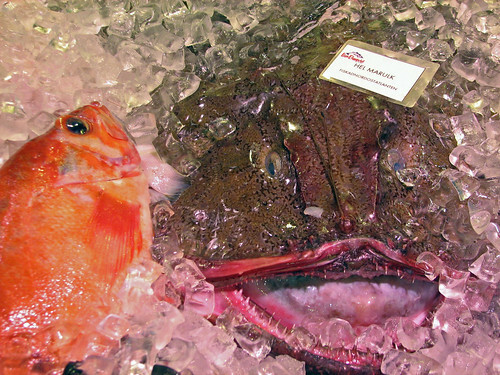 Apparently this fish presents a vocational hazard to N-Atlantic scuba divers. The Wolf fish is related to the Perch, being of the order Perciformes. It is the only Perch like saltwater fish that I am aware of, which is interesting as about 40% of all fish are Perciformes. 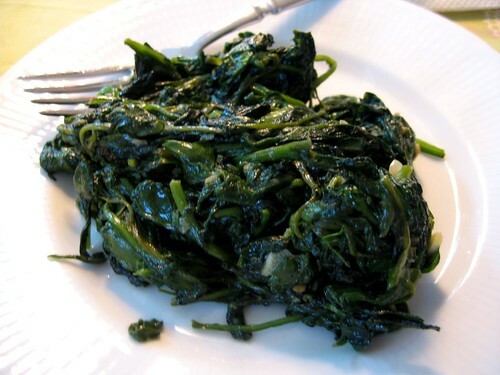 I have only had it cooked a couple of times and found it delicious --- fatty and with more flavor than say cod or haddock. In Iceland we mostly eat this fish dried as a snack, which is sublime. Thanks for the info Oli! We love to get viewpoints from around the world here. There have been some fascinating conversations about Icelandic food including delicacies such as hakarl...got any more to share? 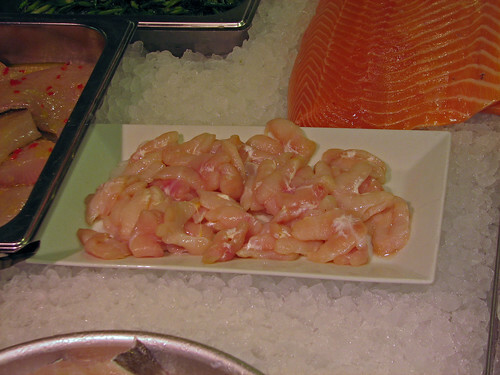 Julia Child in her French Chef television series always described how to buy fish. 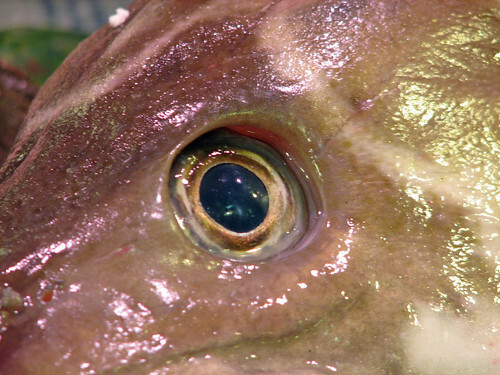 One of the tests of freshness was a clear eye looking very much like this one. Unfortunately in that era and pretty much today as well, you were not likely to find fish in Chicago looking as perky as this cod. Well, one year after starting this thread, it was time for my birthday dinner again. 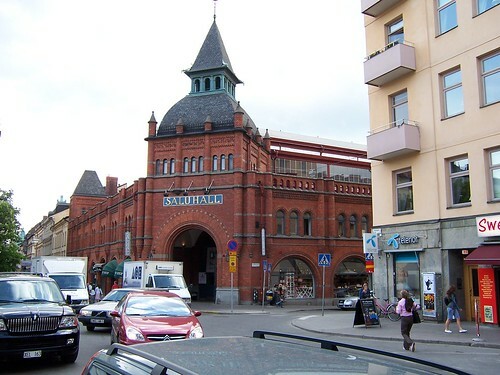 Where else to shop but Östermalmshallen and Willy Ohlsson's? 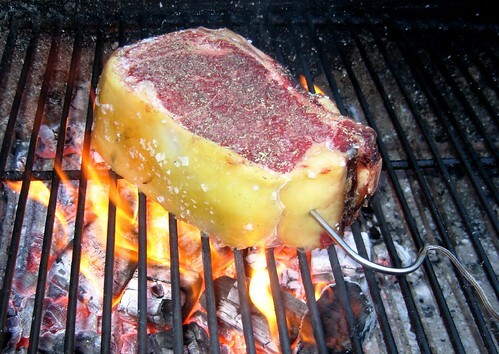 For some reason, I had bone-in strips on my mind... 40 oz. Cost me 470 SEK (67.00 USD or approximately 50% of what I paid for Lobel's version). Happy kids! 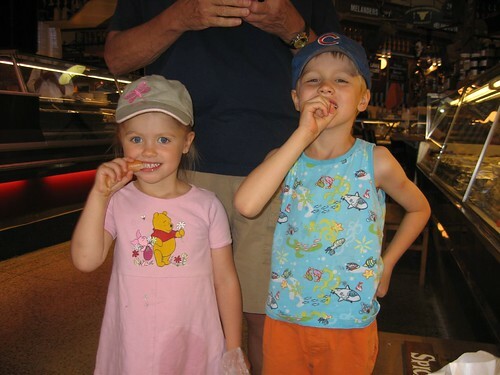 Years of experience has obviously taught the butchers that happy, fed kids make for happy customers. 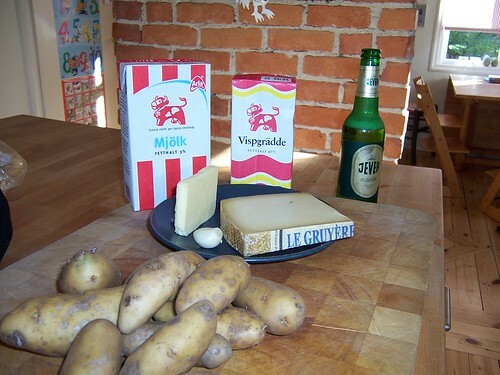 A couple of in-house produced "prinskorv" (or, small hot dogs) did the trick nicely! 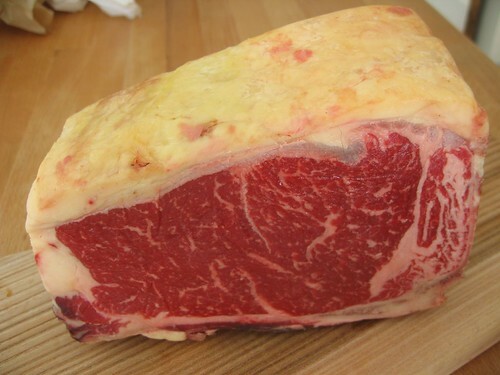 With it's shell of yellowed suet and dried beef, it's pretty hard to miss that this is truly dry-aged beef. 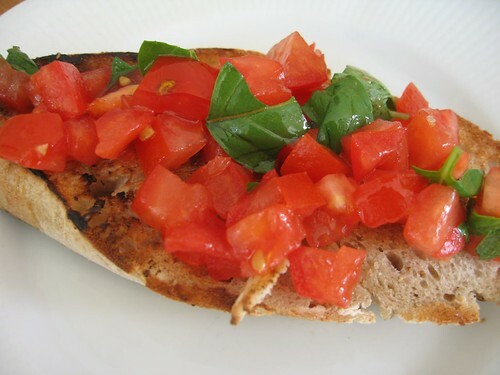 Dinner began with a few bruschetta. I’d decided to grill the steak over hardwood coals so I started the fire with a few logs of hazelnut wood to grill the bread with. 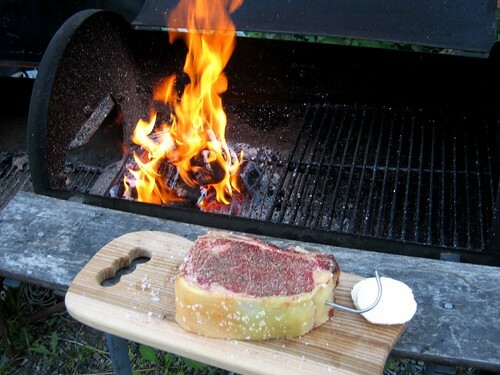 Once grilled, I rubbed the surface of the bread with a clove of garlic. I managed to find a superb supermarket tomato and, after chopping it, added salt, the season’s first basil from our greenhouse and Monini olive oil. 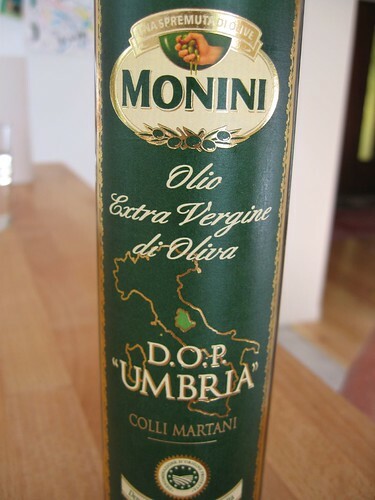 Monini has been briefly mentioned by the esteemed Antonius in this thread. If I were a better person, I’d perhaps admit that this may well have been the highlight of my birthday dinner. Simply exquisite! The slight nutty flavor of the hazelnut wood grilled bread complimented the bread nicely. The tomato was better than many I’ve bought at the height of summer and the Monini was grassy and delicious. 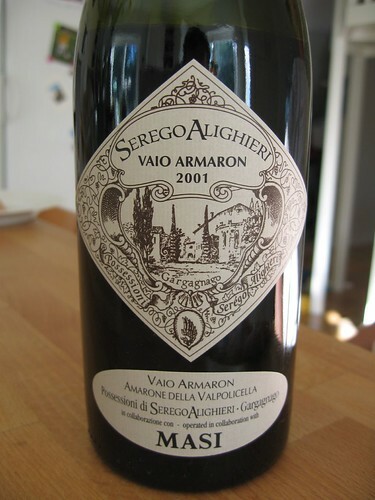 Along with the bruschetta, I opened the evening’s bottle of wine: a 2001 Vaio Armaron Amarone. 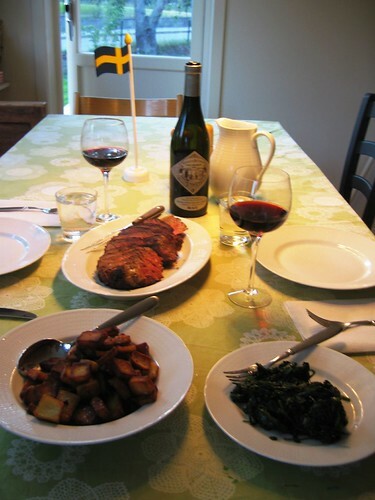 Powerful, slightly bitter and sweet, it would make an excellent match with the beef. After getting the kids in bed, it was time to stoke the fire and get a decent bed of coals ready. I switched from hazelnut wood to cherry for the beef. 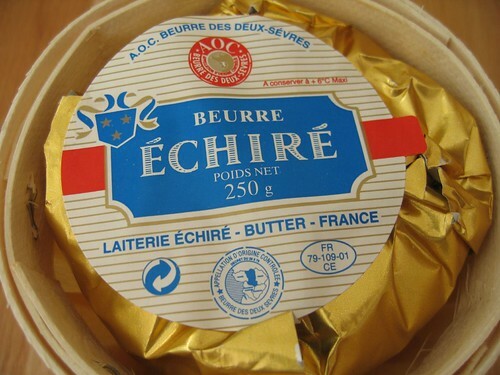 The discs are slices of beurre echire I’d picked up at the market. 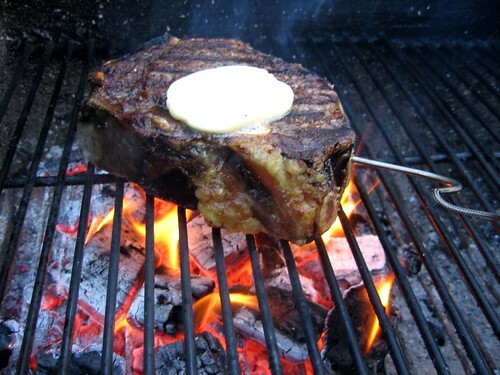 Flip, add butter and close the grill! 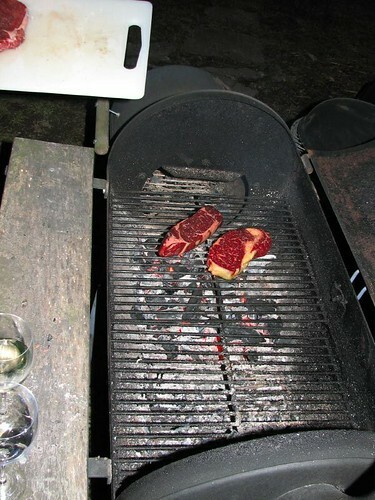 The steak was magnificent. 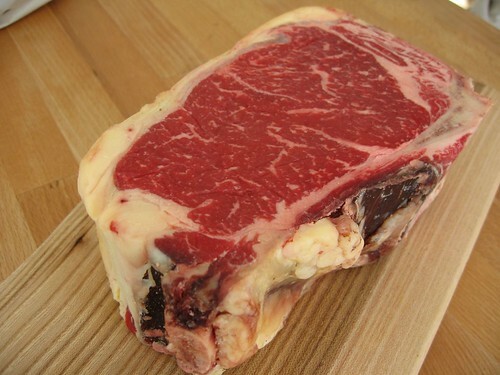 The 30-day dry-aging produces a tender, silky, nicely textured steak with wonderful aged flavors yet still tasting of “steak”. 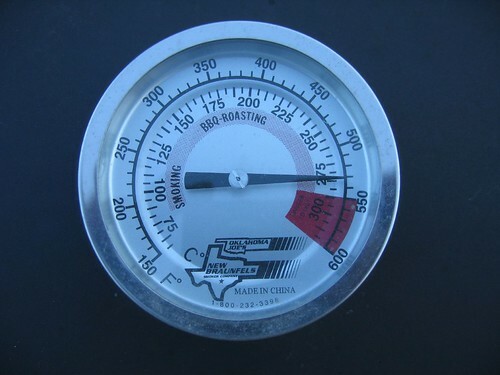 Grilling over the cherry coals added a slight, sweet smokiness that complimented the steak’s char. 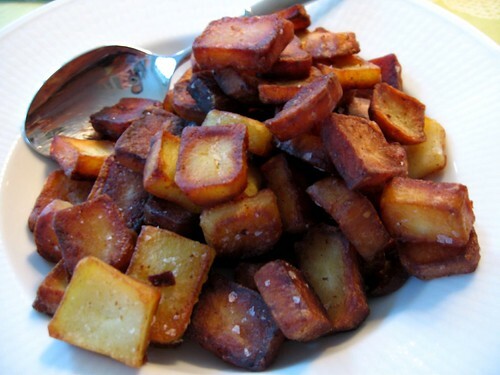 Despite being new potato season in Sweden, I went with the non-new fingerlings as they hold up better when fried. They had a good crunch yet a creamy interior. 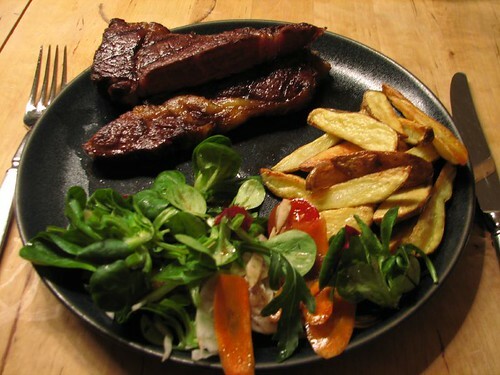 The spinach developed a biting bitterness as it sat (waiting for the thick steak to rest). 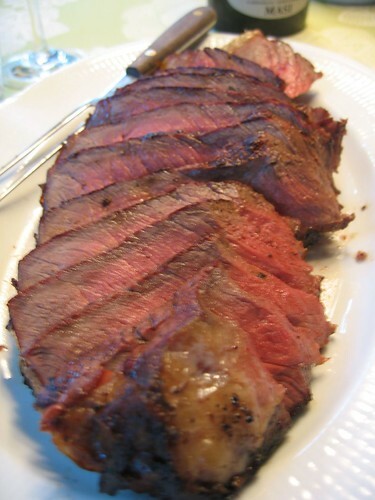 However, they bitterness actually acted as a nice foil to the beef and the rich wine. Last edited by Bridgestone on June 13th, 2007, 12:28 am, edited 1 time in total. I keep finding myself thinking about that bone, Bridgestone. I hope someone got to chew on it. Fabulous photos, as always. And a belated happy birthday. I went back this afternoon, and re-read the whole thread, top to bottom. What a wonderful excursion from birthday to birthday Bridgestone! Tnx sooo much for bringing us along on the trip. Why, I, Ann, the birthday boy, got to chew on that bone! And it was wonderful! 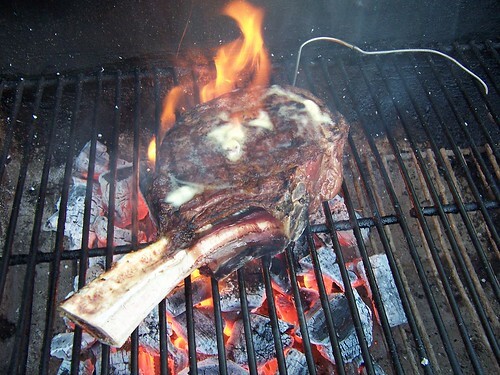 On a side note, as impressive as these massive steaks have been, I'm thinking of going back to ca 1 inch-thick steaks. I've kind of got it in my head that they end up juicier and a little more tender (or less roast-like) after a quick, intensive grilling. 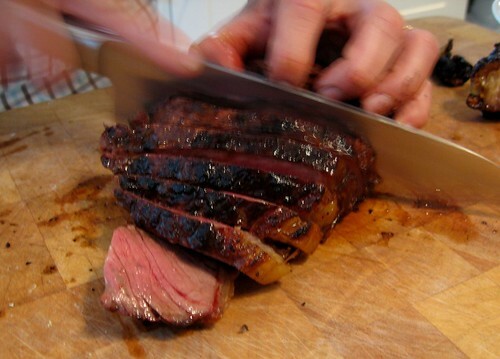 Anyone have any thoughts regarding steak tenderness and/or taste relative to how thickly (or thinly) it is sliced? Thanks for the kind comments, Ann and Geo. This was my first real post on LTHForum about a year ago (after a few years of lurking). Since then, I've documented and posted about a decent number of my dinners. It's been a fun and rewarding experience and I hope to be able to keep up the pace this coming year, too! Geo wrote: I went back this afternoon, and re-read the whole thread, top to bottom. What a wonderful excursion from birthday to birthday Bridgestone! Tnx sooo much for bringing us along on the trip. Yes, a wonderful excursion, though now I have it in my head I'd like to be there for Bridgestone's B-Day 2008.